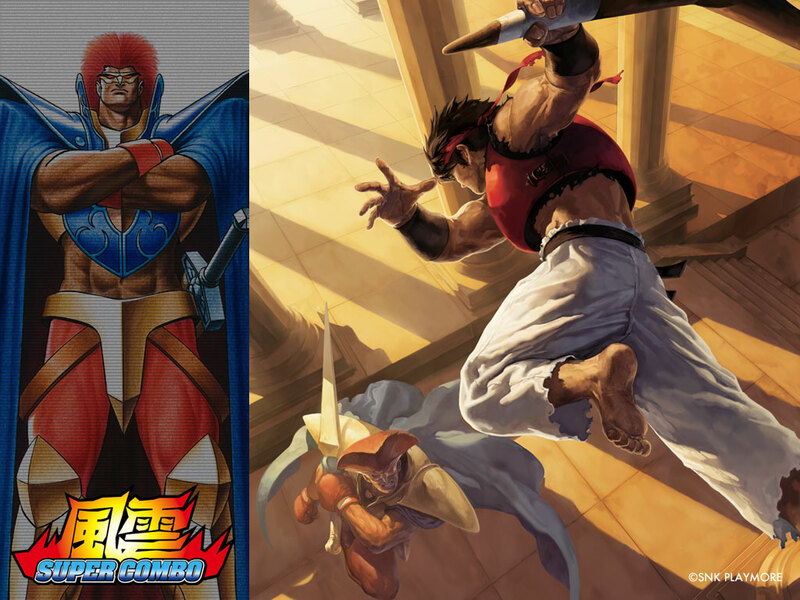 STORY: Savage Reign is set in the first half of the 21st century in the fictional city of South Town (the same city used in the Fatal Fury and Art of Fighting series), which has now been upgraded and renamed as Jipang City. A mysterious legendary fighter known only as King Leo has risen up from the shadows of secrecy and issued a challenge on television for the strongest of fighters to battle against him in a fighting tournament known as the Battle of the Beast God. He promises immense wealth beyond anyone's dreams and legendary fame beyond imagination. 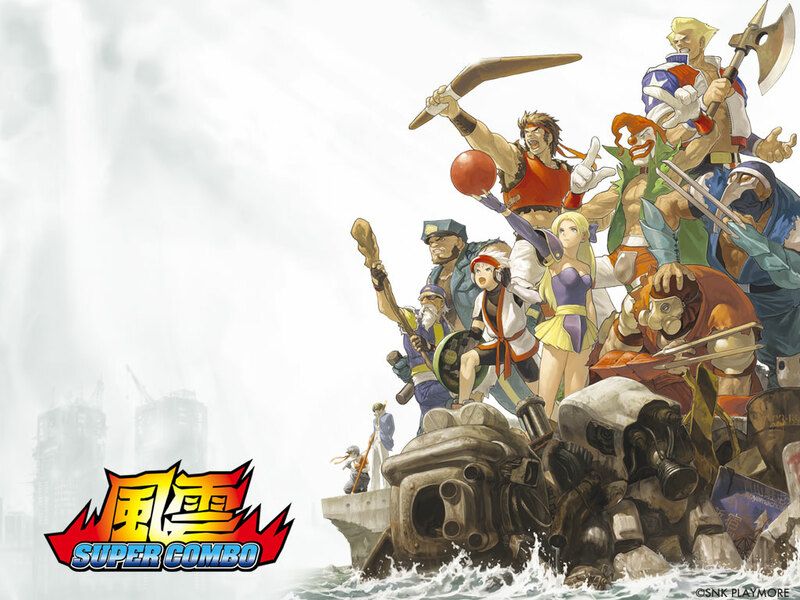 Nine fighters have come to the tournament, each with their own sole purpose and reason for battling against King Leo. Hairy chest of death... like Zangief. 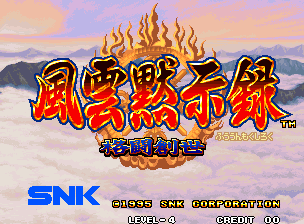 REVIEW: By 1995, SNK had established an impressive variety of solid and growingly popular fighting game franchises. 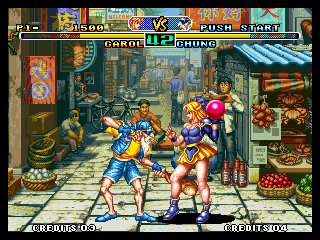 However, there were a variety of fighting games showing up on those NeoGeo cabinets (and elsewhere) that were very commonly being dubbed as "Street Fighter 2 ripoffs". 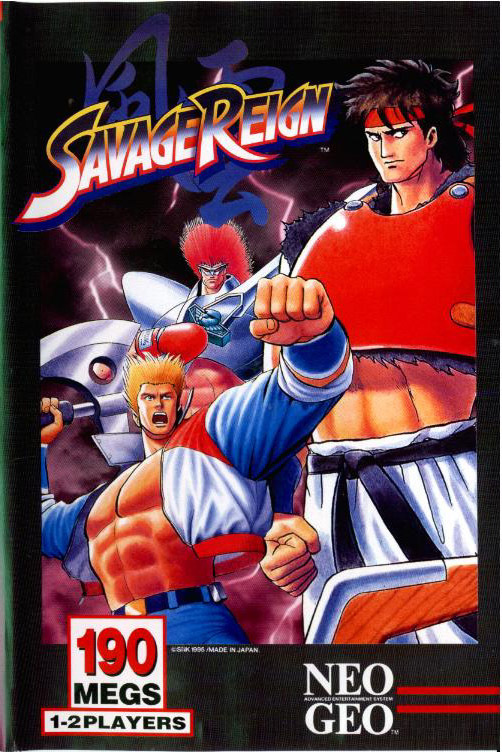 With the mid 90's "me too" fighting game bandwagon going strong, and being lead by games like Fighters History & World Heroes, SNK saw another opportunity to overtake the fighting game scene with Savage Reign. Obviously, that idea didn't really work out in the long run. 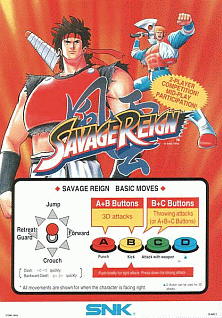 Savage Reign ended up being a pretty rare fighting game to see at arcades. 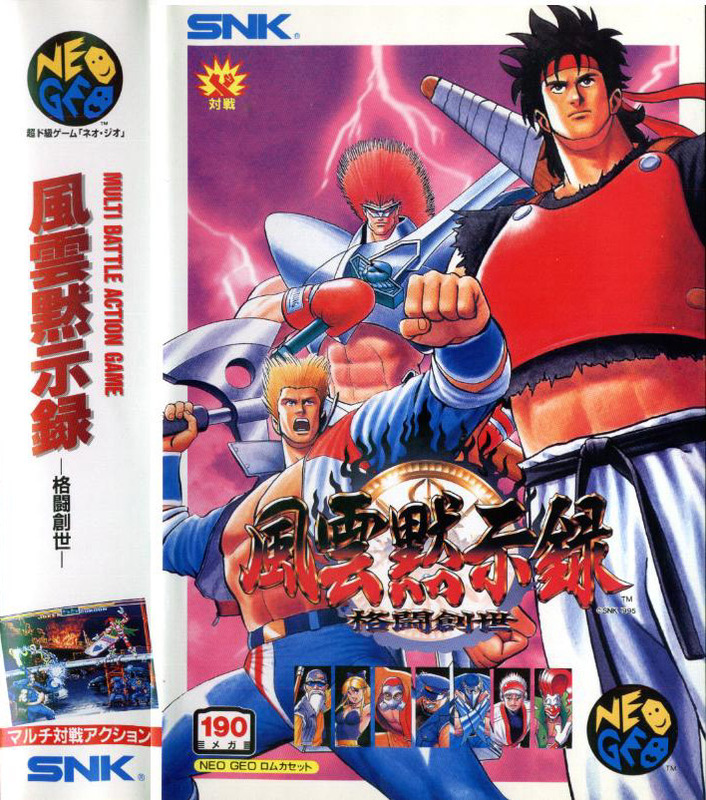 Most NeoGeo cabinets featured games from the more-popular SNK series, like: Fatal Fury, Samurai Shodown and King of Fighters, which most arcade owners were more comfortable taking a chance with. 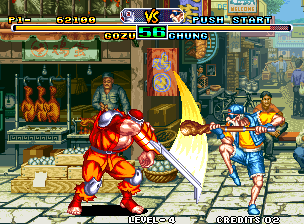 Hayate is your Ryu-type character... with a boomerang. 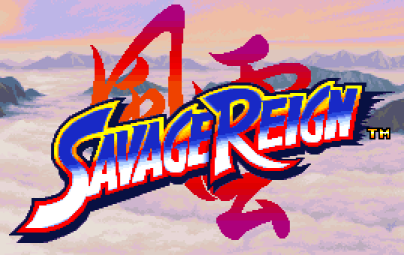 In typical mid-90's "me too" fighting game fashion, the character designs of Savage Reign take obvious cues from a variety of already existing fighting game characters. The cast of Savage Reign is definitely what you'd call obscure, off-the-wall, and just downright strange. The weird characters attempt, but don't really succeed at bringing out the loose "futuristic" theme of Savage Reign, and simply don't have the lasting appeal of other fighters out there. A clown on roller blades VS a rhythmic gymnastics girl? 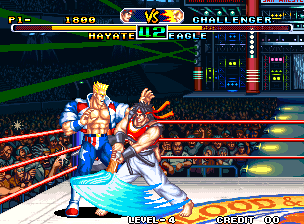 The hand-drawn stages are nicely designed, and like in Fatal Fury, fighters can jump in and out of the background in a few of them. 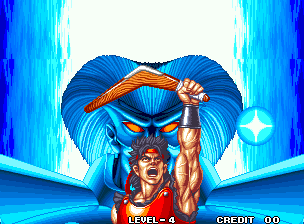 Besides that, your staple punching, kicking, and weapon attacks make up a pretty straight-forward 2D gameplay system. 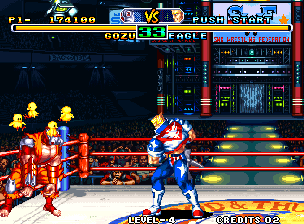 While the halfway solid gameplay engine of Savage Reign makes the game halfway playable, all of the gameplay elements in the game were simply done better in other mid 90's fighting games. 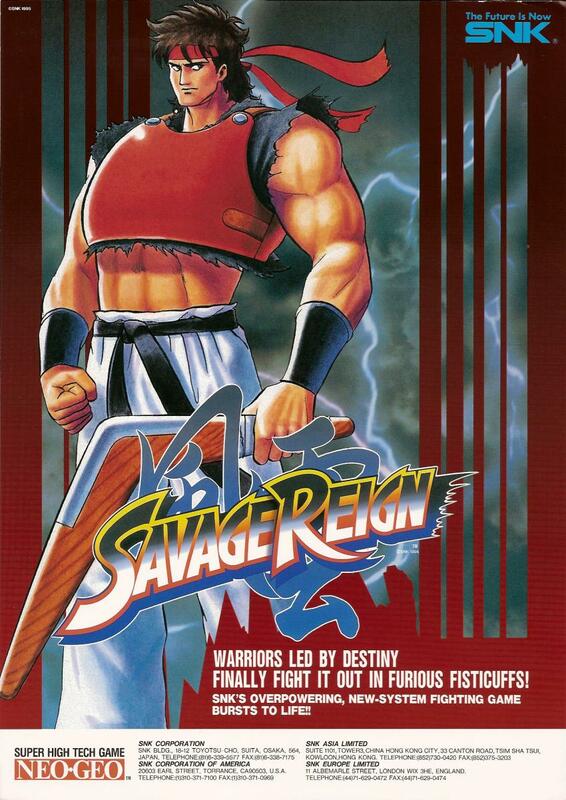 I only played Savage Reign once or twice... and that was more than I ever wanted to play this game. There's not much to the gameplay or graphics that hasn't already been done in 1995... and Savage Reign's characters just seem to be trying too hard to distinguish themselves. 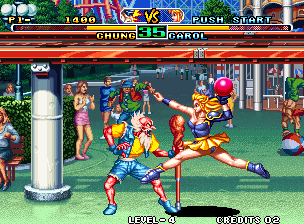 Old school, nostalgic SNK fans might be able to appreciate Savage Reign in some way, but there's no arguing that there were tons of better fighting games to be spending your quarters on in 1995 arcades. 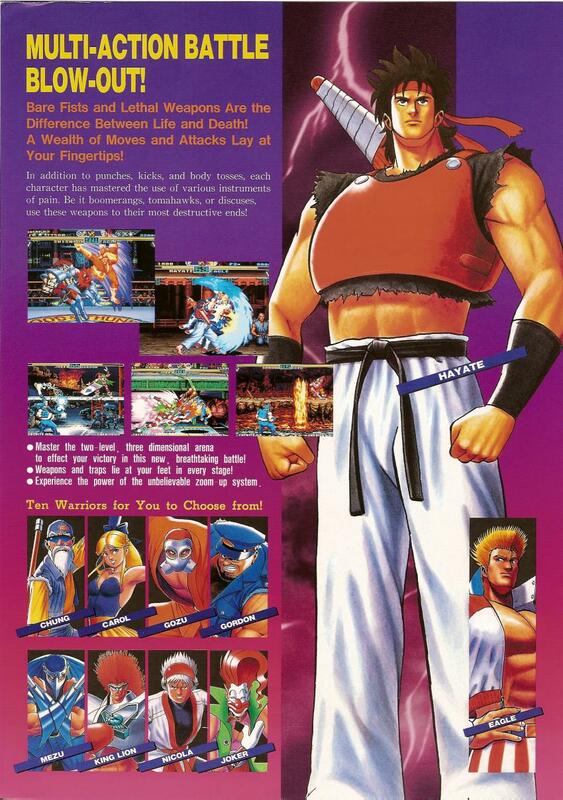 Seriously, "most" of the other new fighting games in 1995 just made Savage Reign look silly.